Not in London, but a chance to get together with local practitioners from across the country: a day conference on Thursday 26 March at St Mary’s Conference Centre, Bramall Lane, Sheffield S2 4QZ, organised by the Inter Faith Network for the UK. The event is free and is open to all local inter faith groups. Book a place by emailing IFN’s Hannah Cassidy with a booking form. Download the booking form here. Enjoy watching the short film we made in Pakistan – the last of our Olympic Truce projects funded by the Foreign & Commonwealth Office. We’re delighted it’s been included in the Royal Society of Arts Pakistan Calling programme. Pakistan Calling is a platform for films showing links between civil and cultural organisations and communities in Pakistan and the UK. 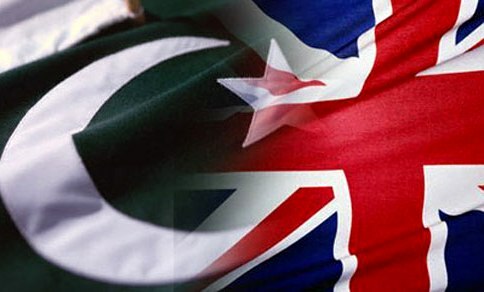 Pakistan Calling aims to build community trust in the UK, and to support the creativity and energy of the British Pakistani diaspora and others working between Britain and Pakistan. The film is on LBFN’s vimeo site as well. You’re welcome to download it to use as a discussion starter or just to show local communities and religious leaders in Pakistan in ways not often portrayed in the popular media. We’ll be following up our 2012 work with the FCO and with the Department for International Development, linking local religious and community organisations with the public sector in smart and strategic ways. The London event was inspiring and threw up a number of possibilities which could include diaspora links with several other countries – let LBFN know if you have ideas to contribute on this. Rt Hon Justine Greening MP (centre) being presented with a World Peace Tartan scarf at the London event of LBFN’s Minority-Majority UK-Pakistan project last month, hosted by the Wandsworth Community Empowerment Network. The Bishop of Lahore is on the right of the picture. Sadiq Khan MP also spoke at the event. 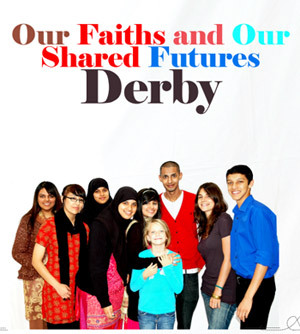 A new booklet, Our Faiths and Our Shared Futures, has been produced by Faith Matters and may interest people working in community safety &/or concerned about violent extremism. It’s been researched locally, in Derby, and supported by Derby’s Community Safety Partnership and the University’s Multi-Faith Centre.